LEED® certification is no secret to anyone in the building industry. It’s become an industry standard, especially with our society’s focus on sustainable living. But is it just a trend, or does green building and LEED® certification really make sense, from a sustainability and profitability perspective? There is a strong business case for green building. As of October 2017, more than 19.3 billion square feet of building space was LEED®-certified worldwide and around 2.2 million square feet achieves LEED® certification every day. The industry focus on ecologically ethical building practices and the energy savings that come along with it (30% energy savings for LEED®-certified structures) make it very attractive to owners and tenants. Even with the potential for higher upfront building costs, the tax credits, energy savings, leasing attraction, and long-term reduction in carbon footprint are compelling financial incentives for forward-thinking builders. Allen & Shariff were early adopters of sustainable green building techniques and LEED. 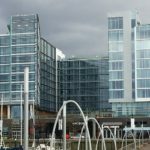 They built their expertise in energy efficient and sustainable design, LEED consulting and building to LEED requirements, and utilizing geothermal systems and renewable energy technologies. The firm is a member of the United States Green Building Council, and CEO Zack Shariff was selected as a participant in the National Renewable Energy Lab’s (NREL) energy executive program. Over 30% of our engineers are certified LEED® Accredited Professionals, and we support LEED® AP certification for our current employees through professional development initiatives. This deep expertise puts us at the forefront of green building practices, a place we’re already used to occupying. Allen & Shariff’s goal and approach with every project is to make it energy efficient, environmentally friendly, and sustainable. 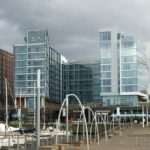 Canopy by Hilton and Hyatt House, a double-branded luxury hotel building on Parcel 5 of the new DC Wharf waterfront revitalization, is the most recent successful effort. 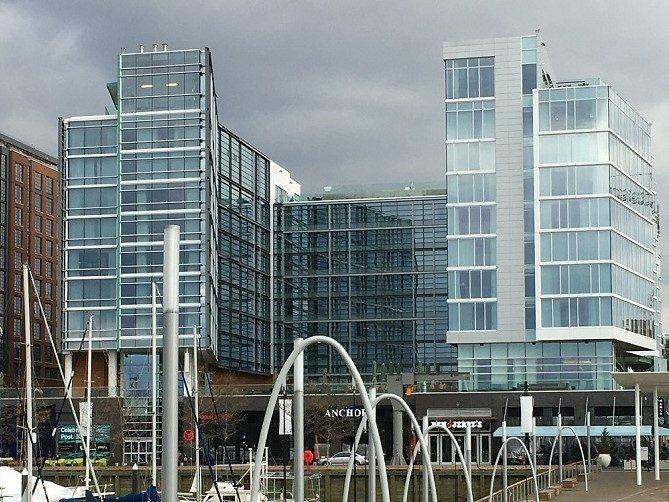 Despite commencing design and construction much later than other parcels, the Hyatt/Hilton building is the first individual building certification at the Wharf, earning a LEED® Gold rating with 61 points. The Parcel 5 hotel project is just the most recent sustainable project in Allen & Shariff’s portfolio. 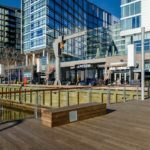 View more of our green projects, like the Aloft Hotel at National Harbor, Google’s Pittsburgh office space, and Allen and Shariff’s own corporate headquarters. These projects are examples of how building green can benefit the environment and your bottom line.